Named after the opera by Richard Wagner, Düsseldorf’s RHEINGOLD were part of Die Neue Deutsche Welle movement which also included artists such as NENA, PETER SCHILLING and ALPHAVILLE. 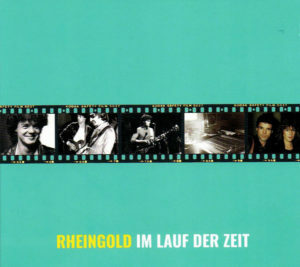 Between 1980 to 1984, RHEINGOLD released three albums ‘Rheingold’ , ‘R.’ and ‘Distanz’, all working with the legendary Conny Plank. Led by Bodo Staiger, the band also featured his now-wife Brigitte Staiger on backing vocals and Lothar Manteuffel on keyboards. Singing primarily in Deutsch, they also differed from their electronically driven contemporaries by having a more melodic vocal style and a distinctive rhythm guitar template. Staiger starred in the 1982 West German horror film ‘Der Fan’ directed by Eckhart Schmidt which warned against the dangers of fanaticism, but RHEINGOLD never performed live so have almost become a forgotten band whenever the history of German pop is discussed. However, the inclusion of 2010 reworkings from a ‘Best Of’ album of their domestic hits ‘Fluss’ and ‘Dreiklangdimensionen’ on the splendid ‘Electri_City 1_2’ 2CD compilation, released by Grönland Records, deservedly placed their work alongside LA DÜSSELDORF, HARMONIA, RIECHMANN, DAF, NEU! and DIE KRUPPS. RHEINGOLD are certainly one of the most under rated acts from the German New Wave, but this year’s excellent new album ‘Im Lauf Der Zeit’ was a fine return after an absence of original material for many years. Bodo Staiger kindly took time out to talk to The Electricity Club about the career of RHEINGOLD. In 2010, you re-recorded the old hits like ‘Fluss’ and ‘Dreiklangdimension’, having also done the ‘Electric City – Düsseldorfer Schule’ 2007 covers album, so why was the time right for a brand new RHEINGOLD album? There was a collection of about 50 songs / layouts over the last years and in 2014, I got back the lightness of playing guitars, so I felt that is the right time for a new album. What was different about your approach to ‘Im Lauf Der Zeit’ compared to your debut and ‘R.’? Compared to the 80s albums, I have learned a lot about studio work, technology and production. So this time, I knew exactly what I wanted and how RHEINGOLD should sound today without changing the style. You give thanks to Karl Bartos in the ‘Im Lauf Der Zeit’ album credits, how was he involved? Karl is one of my best friends, we’ve known each other for a long time and I really appreciate his musical competence. Since I started to work on the selected songs, there were many telephone calls, MP3s and comments between us. Finally he wrote the lyrics for ‘Im Lauf der Zeit’ and ‘Weisses Licht’ for the new album. The artwork also features some nostalgic photos including ones of you and Conny Plank who was involved in all the previous RHEINGOLD albums, what was he like to work with? 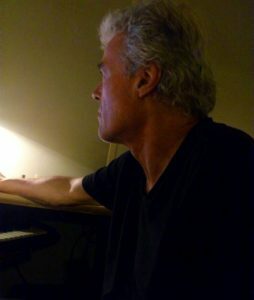 The photos document my musical journey – over time – starting in 1967 with a band called HARAKIRI WHOOM with a young singer called Marius Müller-Westernhagen, who today is a big rock star here in Germany and also the band SINUS with Karl Bartos, THE LILAC ANGELS and my own project RHEINGOLD. Referring to Conny Plank, we met in 1970 and I recorded – with Marius and Karl – my first tracks with Conny that year were at the Rhenus Studio near Cologne. To work with him was always a pleasure, he was relaxed, very competent and had the talent to listen what the artist wants. And he also brought some good ideas and inspiration. For example, the percussive synth sound on ‘Dreiklangsdimensionen’ was his idea. Like classic RHEINGOLD, there are several great instrumentals on this new record. Was the opening track ‘Kraut’ intended as a kind of statement? ‘Sternstaub’ is very electronic compared with other RHEINGOLD tracks, what inspired this? The wonderful ‘Paradieshafen’ sounds like OMD meets Michael Rother? 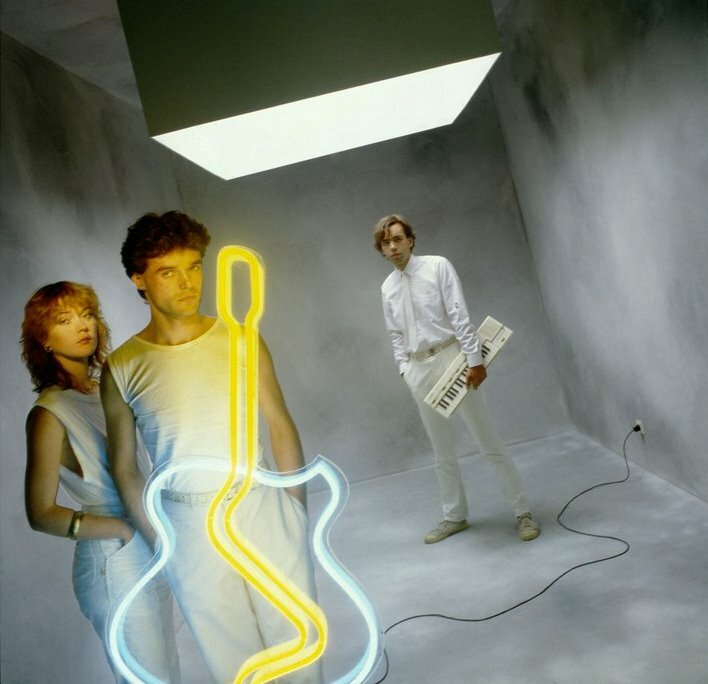 ‘Theme ‘84’ recalls LA DÜSSELDORF, is it true you gave Klaus Dinger guitar lessons? What he a compliant student? That’s correct, musically regards to Klaus. I don’t remember the guitar lessons, but I played a lot of sessions with Klaus at his studio Im Grund here in Düsseldorf… maybe I showed him some chords or licks and tricks. Of the songs on ‘Im Lauf Der Zeit’, which ones have become your favourites and why? You disliked working with drummers and preferred drum machines, were there any particular reasons for this? RHEINGOLD did not perform as a live band; do you ever regret this? No, RHEINGOLD was always a one man band. I never thought about performing live. How do you feel about the renewed interest in RHEINGOLD? Well, we enjoy it. But let’s see the result end of the year. What were your career highlights with RHEINGOLD? The first years – ’81 to ’84 were our good times, TV shows and films and sales. What is next for you, either as RHEINGOLD or with your other musical interests? First of all, we’re trying to promote the new album and keep our Rheinklang studio going.